Finally I've made a couple of the Crossed Structure Binding Solo books. I couldn't use leather for these since the covers need to be folded double - and the kind of leather I use won't work well like that. 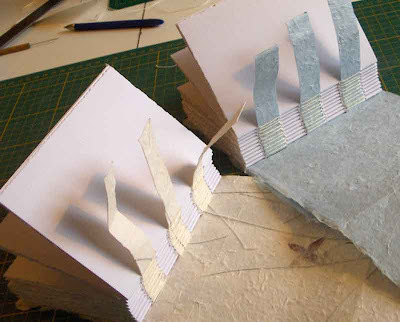 So these books have handmade paper for the covers. 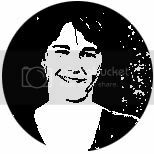 I first did the CSB Solo in 2004 in a class with Susan Mills at the Dawson Print Shop. These two books are made using my notes from that class. I compared this to Arregui's CSB Solo instructions and there are some differences so I will have to do another session on the CSB Solo and actually follow her instructions next time. The main difference between the CSB Solo and all the other CSBs is that the cover is made with one long piece of paper (or vellum or whatever you're using) and the front and back covers are never cut apart. 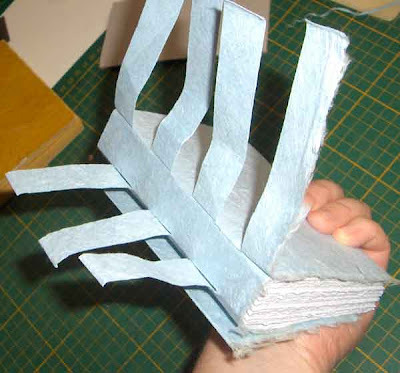 The sewing strips are cut from one end and stuck though where the spine will be - then the text block is sewn onto the strips. Then the other cover is folded into place and all the strips are waving around at the back. At that point, the strips are crossed over the spine then stuck through little slits in the front and back covers. 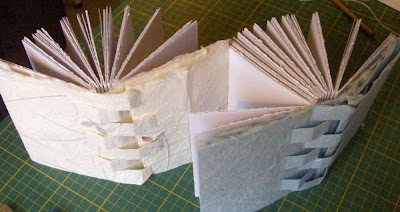 I like these little books with the handmade paper covers. I spend so much time working with leather that it is fun to get away from it occassionally. And now that I've looked back at Arregui's instructions I do want to try this again to see how it differs. Thanks for sharing this book construction.